bulbous swelling of the terminal phalanges of the fingers and toes, giving them a “club” appearance; the normal 160° angle between the nailbed and the digit increases to 180°. It may be an early stage of hypertrophic osteoarthropathy, or it may be without subsequent changes in the long bones. The specific etiology is not known; however, in adults many cases are due to pulmonary disease and resultant hypoxia, and some other cases are due to heart disease, liver disorders, or disorders of the gastrointestinal tract. Clubbing can be assessed by having the patient place the nails of the fourth (ring) fingers together while extending the other fingers; a diamond-shaped space between the nails indicates absence of clubbing. A condition affecting the fingers and toes in which proliferation of distal soft tissues, especially the nail beds, results in thickening and widening of the extremities of the digits; the nails are abnormally curved, the nail beds excessively compressible, and skin over them red and shiny. See: hippocratic nails. 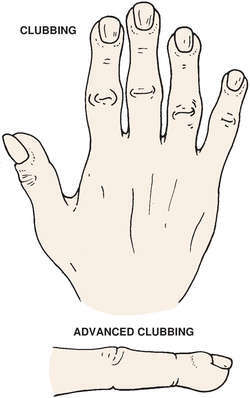 /club·bing/ (klub´ing) proliferation of soft tissue around the ends of fingers or toes, without osseous change. an abnormal enlargement of the distal phalanges with a flattening of the curvature of the nail margin at the cuticle, where the nail meets the cuticle. It usually is associated with cyanotic heart disease or advanced chronic pulmonary disease but sometimes occurs with biliary cirrhosis, colitis, chronic dysentery, thyrotoxicosis, and sickle cell anemia. 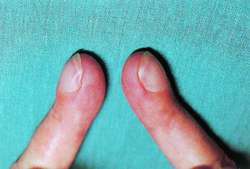 Clubbing occurs in all the digits but is most easily seen in the fingers. Advanced clubbing is obvious, but early clubbing may be difficult to diagnose. Clubbing is present if the transverse diameter of the base of the fingernail is greater than the transverse diameter of the most distal joint of the digit. The nail base angle measures more than 160°. See also Schamroth window test. A condition affecting the fingers and toes in which proliferation of distal tissues, especially the nail beds, results in thickening and widening of the extremities of the digits; the nails are abnormally curved and shiny. Clubbing is the rounding of the ends and swelling of fingers found in people with lung disease. n a deforming enlargement of the terminal phalanges of the fingers. It is usually acquired and may be associated with certain cardiac and pulmonary diseases. Q. When should I use fitness club before work or after or maybe during lunchtime? I am working in a company that was once my dream. I worked very hard to find my dream job and finally I found it. We have all the facilities here including a gym. I spend most of the time at office so I don’t have time to spend in other activities after office hours. So I have planned to make use of my time at my office itself to improve my health too. If I am using our fitness club, then when should I use it before work or after or maybe during lunchtime? A. Hi Johnson, It’s best that you warm up a little bit before work and after work. You can also use the treadmill and the wave-runner bag for kickboxing that will help you to tone up. Wait till 6pm and then work out using all the amenities that suit your body. Do not overstrain or overdo any of the exercises. It’s good if you do some stretching exercises to warm up and after a workout to relax your muscles.